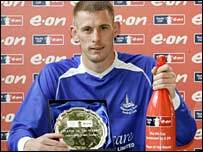 Halesowen Town striker Matt Lewis has won the first FA Cup "Player of the Round" award of the 2006/07 season. He scored all four goals in their 4-2 win at AFC Telford United in the first qualifying round on 16 September. Rocester's David Brown, Bashley's Richard Gillespie, Hemel Hempstead's Gary Sippets and Brackley's Tom Winters were the other four players nominated. Lewis is the first player in the "Team of the FA Cup", and will receive a VIP invitation to the 2007 FA Cup final. He will also be given an engraved silver salver, and wins £500 worth of football equipment for a local school of his choice. Fans can vote for the player of their choice in each round on the Football Association's official website.